First 25 in Line at 11:55 PM to Sign Up will be able to Choose a Free Ultra Pro Deck Box or Solid Color Playmat (Various Colors). Entry Fee - $25 for each Event, Store Credit/ Gaming Bucks may not be used towards Pre-Release Entry Fee. Free PIZZA provided & Refreshments (Soda or Bottled Water, 1 Per Entrant Per Day) for all three Events. Save $1 off by Pre-registering & guaranteeing your spot in the event. 3 Day SPECIAL Pre-Registration Price - SIGN up for all 3 days before Thursday 7/5/18 before the Pre-Release for $70. In addition this MIDNIGHT event will be capped at 30 players. Our LAST few midnight releases Sold Out, so if you want to play in this event, please pre-register. The Entry Fee will cover your seeded Pre-Release pack to build your deck, land, and of course adding 2 prize packs to the pool per person. As always it will be a 4 round tournament and prizes are based on record with a 2-2 receiving prizes. NOTE - The point of a Pre-Release is to get new cards into as many players' hands as possible. We will not be "playing it out" with a few top players getting all the prizes. That completely invalidates the purpose of the event. We will also be giving away at least 4 Door Prizes at each event that may include Playmats, Card Sleeves or Deck Boxes. Enjoy Collectors Corner's comfortable spacious gaming Area & friendly atmosphere. Prizes - Based on attendance. Format - Format is Sealed Deck. Pre-order Now and pick up a Box or Boxes During Pre-release at WPN Participating Stores and receive a Special Buy It By The Box Pre-release Pre-order Promotional Card. Limit 2 Booster Boxes Per Customer, Pre-ordered, Pre-Paid Booster Boxes will be Available for Pick up During MTG Core Set Pre-release Weekend at Collectors Corner Parkville - HQ on 7/7/18 & 7/8/18. Dominaria was the first time you've ever been able to preorder your booster box and pick it up right there at your Prerelease, before the set is even technically out! That proved to be a popular option, so we're sticking with it. 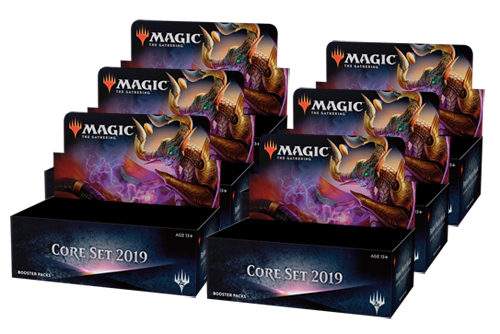 For Core Set 2019, Guilds of Ravnica, and beyond, you'll have the opportunity to preorder your booster box for Prerelease pickup at your local game store and get your hands on the new cards faster than ever!